PHILADELPHIA--(BUSINESS WIRE)--Carvana, a leading eCommerce platform for buying used cars, announced today its continued expansion into the Northeast with the launch of its Philadelphia market. This addition marks the company’s second market within the state of Pennsylvania, following a successful launch in Pittsburgh in late 2016. With this launch, Carvana now offers free as-soon-as-next-day delivery to nearly 152 million consumers nationwide, including more than 8 million living within 50 miles of the Philadelphia city center. Recognized as one of the “Best Entrepreneurial Companies in America” by Entrepreneur Magazine's Entrepreneur 360™, Carvana’s advanced, proprietary technology allows for a complete and seamless online car buying experience. By visiting carvana.com on a mobile phone, tablet or computer, customers can search for, buy, finance and trade in a vehicle, all from their desktop or mobile device. By answering 10 questions, customers can obtain financing options with no impact to their credit and know precise payment terms for all 7,250+ vehicles in Carvana’s online inventory. The entire transaction can be completed in as little as 10 minutes. In 2016, Carvana customers saved an average of $1,430 versus Kelley Blue Book Suggested Retail Value. After completing the online purchase process, customers in Carvana’s markets can schedule as-soon-as-next-day delivery, or can choose to pick up their vehicle from one of Carvana’s proprietary automated Car Vending Machines in Nashville, Houston, Austin or San Antonio. All vehicles are Carvana-certified to meet the company’s 150-point inspection, and feature a 100-day/4,189-mile bumper-to-bumper warranty. Carvana honors each purchase with a 7-Day Return Policy, allowing customers to return the vehicle for any reason within that window for a refund. 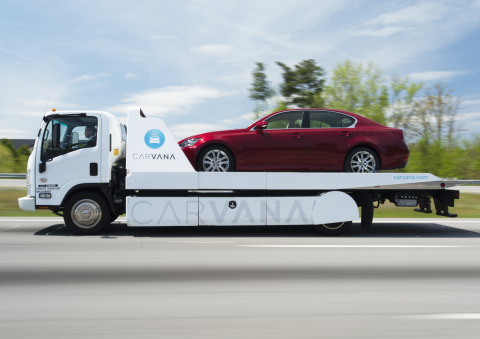 To date, Carvana has delivered cars to customers in 47 states. Carvana now offers free, as-soon-as-next-day delivery to residents in 23 markets: Atlanta, Austin, Birmingham, Charlotte, Cincinnati, Cleveland, Columbus, Dallas, Hampton Roads (Va.), Houston, Indianapolis, Jacksonville, Memphis, Miami, Nashville, Orlando, Pittsburgh, Raleigh, Richmond, San Antonio, Tampa, Washington, D.C., and now Philadelphia. As a thanks to Philadelphia’s early adopters who purchased a vehicle from Carvana prior to today, Carvana will fully refund any delivery fee paid. Founded in 2012 and based in Phoenix, Ariz., Carvana’s mission is to change the way people buy cars. By removing the traditional dealership infrastructure and replacing it with technology and exceptional customer service, Carvana offers consumers an intuitive and convenient online automotive retail platform, with a fully transactional website that enables consumers to quickly and easily buy a car online, including finding their preferred vehicle, qualifying for financing, completing the purchase and loan with signed contracts, and receiving delivery or pickup of the vehicle from one of Carvana’s proprietary automated Car Vending Machines. For further information on Carvana please visit www.carvana.com, or connect with us on Facebook, Instagram or Twitter. Carvana, a leading online auto retailer, is bringing as-soon-as-next-day delivery to the City of Brotherly Love.